Lee Lindquist, ‘00 MD, ‘05 MPH, ‘10 MBA, ‘03 ‘05 GME, is helping to expand home-based primary care for seniors. For many seniors, there’s no place like home, even when health problems become difficult to manage. 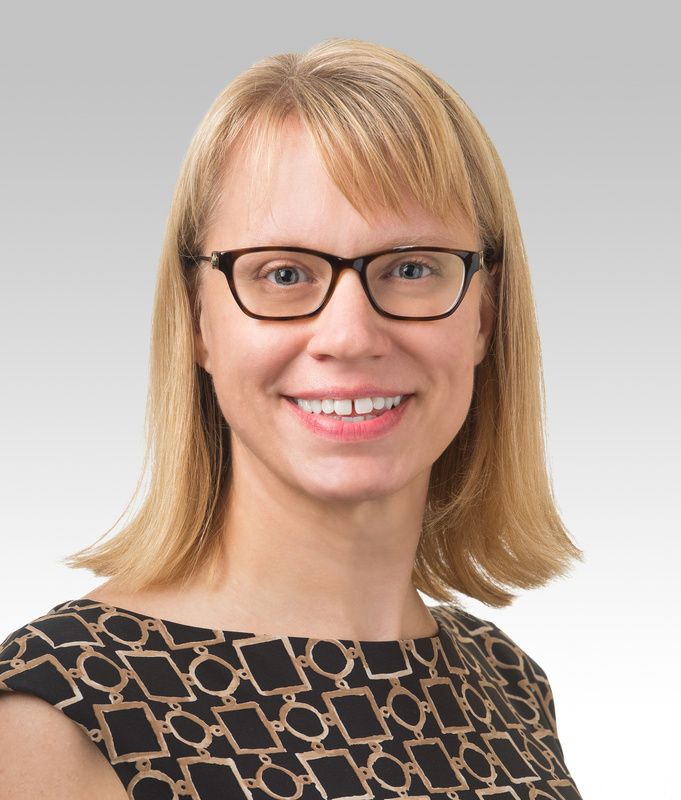 As such, Lee Lindquist, ‘00 MD, ‘05 MPH, ‘10 MBA, ‘03 ‘05 GME, section chief of Geriatrics and associate professor of Medicine in the Division of General Internal Medicine and Geriatrics, is committed to helping ensure that seniors are able to remain in their own homes as they age. Last year, Lindquist led the expansion of a Northwestern Medicine Home Care program that offers primary care visits in seniors’ own residences — a service intended not only to reduce nursing home placement but also cut down on healthcare costs, offer a better patient experience, and give providers a more comprehensive picture of a senior’s overall health and lifestyle. But the desire for such home-based care currently outpaces the number of available providers. To help answer the call, Northwestern is now joining a national initiative to increase training of professionals in the field and ensure the benefits of home-based primary care are made available to more seniors. In August, the Home Centered Care Institute (HCCI), a non-profit organization dedicated to advancing high-quality primary care in the home, named Northwestern one of just eight “Centers of Excellence.” As part of this national network, Northwestern will join other top medical institutions — including Cleveland Clinic, the University of Pennsylvania, Mount Sinai and the University of California, San Francisco — in offering a new training program in home-based primary care. The program, launched at Northwestern in December, offers tracks for providers — such as physicians, nurse practitioners and physician assistants — as well as supporting clinicians and administrative leaders. The training spans both classroom instruction and field experience, and also includes ongoing support and education. “Having more practitioners provide home visits is a really key way that we can make sure that our seniors are able to stay in their own home,” Lindquist said. Why is home-based primary care so important for seniors? It’s all about helping seniors age in place — because that’s really the best place for seniors to be. Seniors at home have less depression; they experience more joy being in their own surroundings. But we also want to make sure they aren’t becoming isolated, that they are still able to receive good healthcare, and that they are safe in their own home — that’s where the geriatric home care program helps fill in a large gap. Not only do we know that patients do better in their own home, and that patients want to be treated in their own home, but it’s also more cost-effective. Most of these seniors really need a good primary care doctor, and if they don’t receive care at home, they end up using the emergency room or hospitals more. 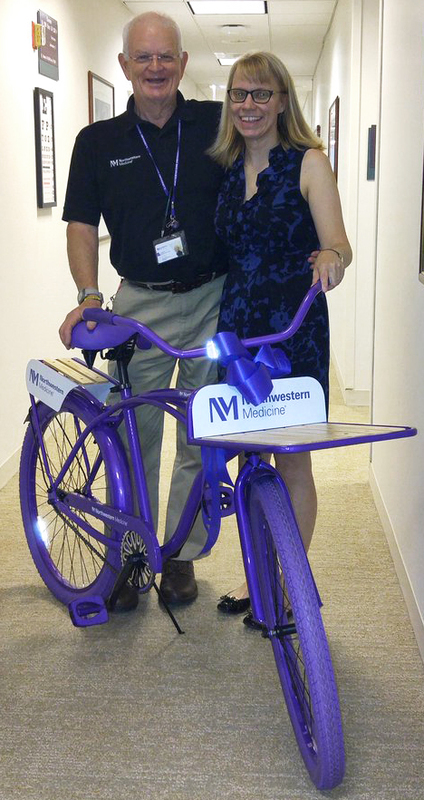 Lindquist with Dwayne Dobschuetz, a geriatric home care nurse practitioner, and the purple Northwestern Medicine bike he uses to reach the homes of his patients. What are the goals of the new training program? There’s really been a national push to make sure we are taking care of patients in the most efficient way, and as such, have more providers in home-care medicine. At Northwestern, we’ve always been interested in serving seniors in their own home, but we were recently selected as a Center of Excellence by the HCCI to deliver this training program, with the goal of increasing the number of providers trained in home-care medicine. Physicians and nurses typically receive training on people in the hospital, in clinic and in procedures — but we really don’t get much training on how to take care of patients in the home. And taking care of patients in the home is a lot different than taking care of patients in out-patient settings. There are many nuances to home-based care. For example, it might entail looking into someone’s fridge and seeing if they have enough food or if are they adhering to special dietary regimens, noticing if there’s a hoarder mentality, or seeing floor mats that are peeling up everywhere that might cause a senior to fall. These are things that we are able to train the eye to look for, as well as train on how to remedy things in the home, especially when you don’t have the resources of being in a huge hospital. It’s all about learning how to do things that can help keep seniors in their own home. What are some of the logistics of providing primary care in the home? Because we are urban, most of our patients actually live within walking or bicycling distance from the seniors we visit. Plus, parking downtown here is painful! So we’ll either bike, walk or use public transit. Since we don’t use cars — which most house visits are typically done by — we had to leverage microtechnology to make sure everything is small and portable. All of our equipment can be carried around in a duffle bag. For instance, we have an EKG machine that actually fits onto the back of our smartphone, so patients can just put their thumbs on the back of our phone and we can see what their EKG looks like. There’s a lot of adaptability, flexibility and inventiveness that goes into providing care in a senior’s home. For example, not everybody is going to a have a fully flat bed where you can examine them — sometimes they might be sleeping in a big lazy boy chair, and you just find ways to work around that. What are some of the benefits for healthcare providers? It’s extremely fulfilling. Because you are coming into their home, the patients feel like you are almost part of their family. It’s more of a nurturing relationship, because you’ve taken the time to come to them, to see pictures of their loved ones, to talk about their favorite things in their house. From a training perspective, it’s been phenomenal, too. By seeing patients in their natural environment, you get so much more information about them. We’ve been able to take our medical students and residents with us on home visits and it’s amazing to see their eyes just about pop out of their heads when they see what actually goes on at home. As doctors, we can give a patient a list of medications and tell them to take them, but at home you see how patients actually implement them — medicines may have expired or become mixed in with other people’s, for example. You get a much fuller view of medicine when you see patients in their own home.